In this tutorial we will show you how to enable SEO-friendly URLs for your Joomla website. It is always a good idea to take advantage of this feature as it will eventually ensure a better placement for your website in search engines while making the links on your website easy to read by humans. Start by renaming the htaccess.txt file that comes with the default Joomla installation. To do that, you need to log into your cPanel account and navigate to the Files tab and then File Manager. Select Home Directory from the available options. Also enable the Show Hidden Files (dotfiles). option. 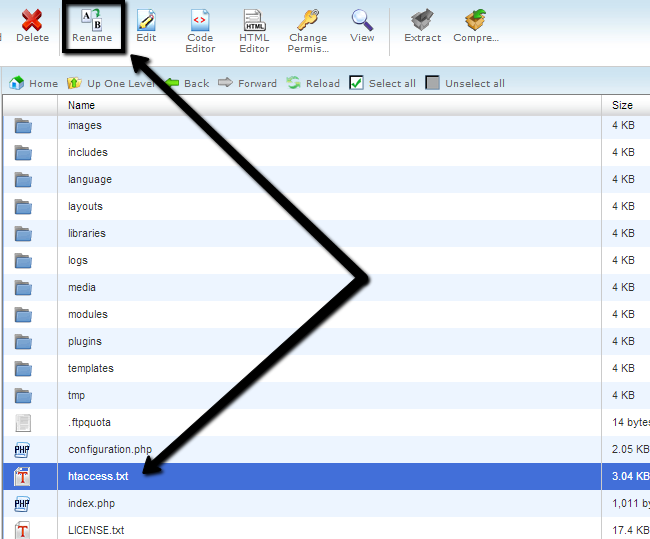 Locate the htaccess.txt file within the main directory of your Joomla installation. Select the file and click on the Rename button at the top-menu. Rename the file to .htaccess and then save the changes. Log into your website as administrator and navigate to System tab on the top menu and then Global Configuration.